Finally the worm has turned. After supporting singers, musicians and actors both on international stages and in thousands of run- down dives for decades; after spending much of my formative and unformative years preparing a stage for other people, finally ... finally ... I am ON IT. Yes, at 62 years of age my time has come and I get my premiere performance on stage with a rock and roll band. Admittedly no one has asked me to sing or play, but I am still ON IT, and with an important role. 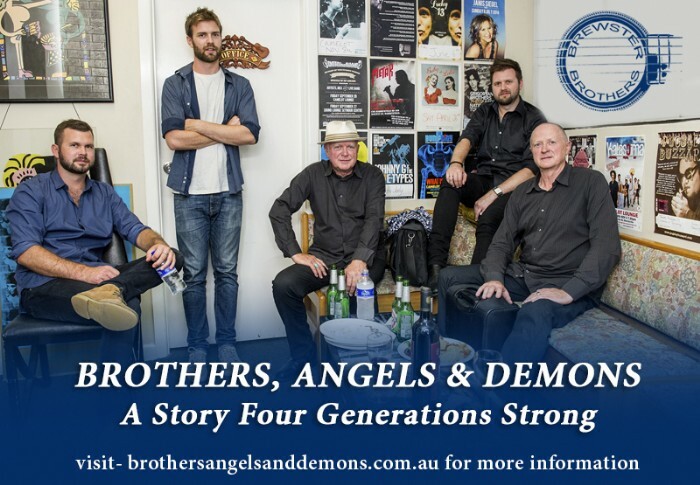 As Narrator in BROTHERS, ANGELS & DEMONS, I illuminate the life story of my old friends the Brewster Brothers. Between songs I am the Inquisitor, teasing out their amazing personal story that reaches back into South Australian music history. I know them as only a roadie and friend can. Like the warriors to whom Henry V spoke - 'we few, we happy few, we band of brothers' - I was there as we toured the world, gig after gig, town after town, song after song. I was there as crowds grew as their band The Angels took Sydney by storm, thousands pouring into a gig that should have only held a few hundred souls. I was there when we played Seattle and Portland, New York and London, as we rocked a French crowd in Paris and blew Cheap Trick off the stage. I was there at Alberts where we recorded Face to Face and AC/DC played below us, the muffled strains of 'Long Way to the Top' heard through the soundproofed studio. To sum it up, I was there. Come along if you can, you South Australians, to the Goodwood Institute in Adelaide on December 19th, yes the Saturday before Christmas, if only so that as I address the room I will know that some of those in the audience, even if only a few, after all these years, came to SEE ME. And to all those who can't I wish you a Merry Christmans and Happy New Year and hint at some interesting things ahead in 2016 for this old Swagman. I AM DELIGHTED TO SEE YOU CANT KEEP A GOOD MAN DOWN. I just wish my son sholto who is a theatrical was there already as he helps run the theatre in the holden a street festival,part of the adelaide fringe every year and will there end of jan/beginning feb. Break a leg and enjoy Raymond we wish you a happy,health and safe festive time.